Choosing materials and decorations that lived on past our wedding day was important to me throughout the wedding planning process. Each year around 2.5 million weddings take place in the U.S. leaving behind an average of 400-600 pounds of trash. Finding more earth friendly wedding resources should really be at the top of everyone's wedding planning list so the decision to move away from traditional flower arrangements was simple for me. I created hundreds of felt flower stems to bring my wedding-decor vision to life, but knew it wouldn't be complete without the special touch of Glass Gardens and the precious plants and terrariums. As I was planning, I came across several other reasons that alternative wedding arrangements are better than real flowers (or even silk), and feel it's important that other brides-to-be know these secrets as well. Succulents and felt flowers won't wilt in warm weather or freeze when exposed to cold weather. These alternatives are durable - think flower girls! Arrangements can be made well in advance so there are no last-minute scares of drooping blooms. Approximately 85% of flowers are imported from other countries. Having to traverse thousands of miles, these delicate beauties increase your carbon footprint and use up extra water resources. Since people don't eat imported flowers, authorities often times aren't using strict testing procedures for pesticides and fungicides. Workers can be exposed to toxic chemical poisoning, and these harsh chemicals can take their toll on local water supplies, bird populations and ecosystems when they eventually end up in the trash. Potted plants can be used as favors for your guests or can be transplanted into gardens or future arrangements. Felt flower arrangements keep their shape and color for a lifetime so gifting centerpieces or bouquets to guests makes for a cherished keepsake. 4. Better for the budget. Sometimes flower alternatives can be just as expensive - or more - than the real thing (i.e. silk flowers). However, choosing plants that are in season or have less maintenance needs definitely helps cut costs. 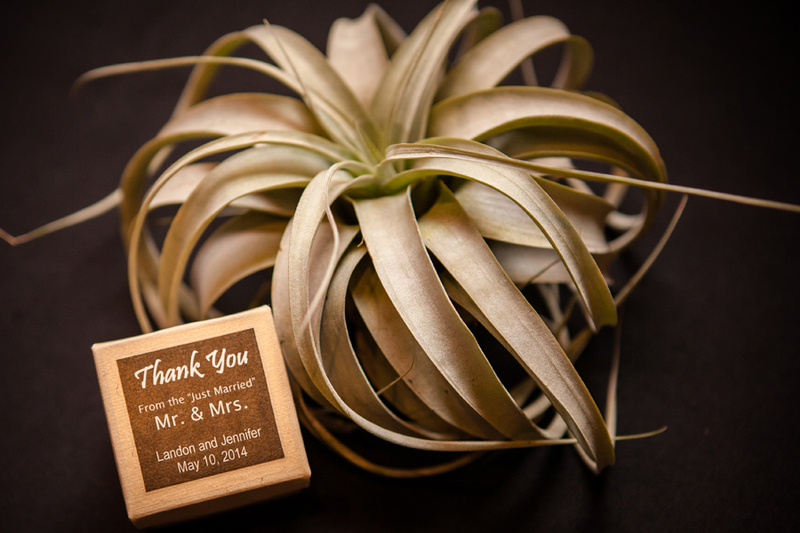 Buying locally lowers the environmental impact of your wedding. It saves transportation costs, reduces emissions, and it keeps the money in the pockets of your neighborhood businesses thus supporting your local economy. Weddings are a once in a lifetime event, and every bride wants hers to be the best. Fortunately, choosing materials wisely, being aware of environmental impacts, and being cost-savvy is a beautiful look for any bride.